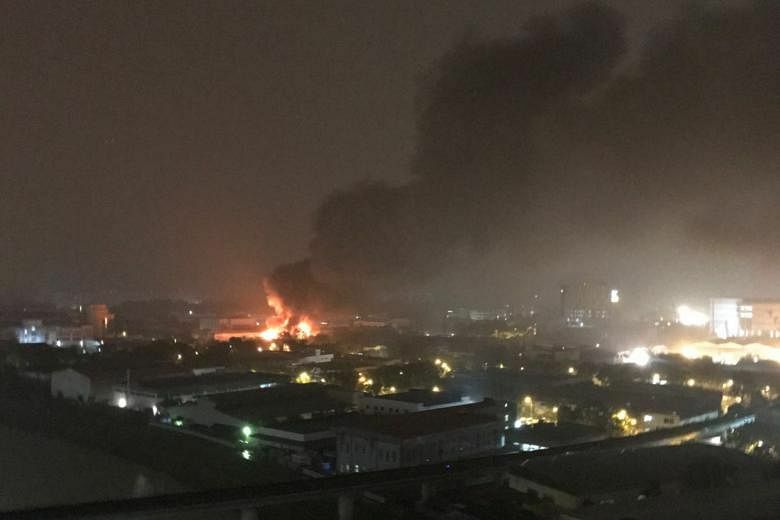 SINGAPORE - A huge fire broke out at a three-storey warehouse in Sungei Kadut early Wednesday (Nov 2) morning. A total of seven workers who were trapped in the office block - three from the roof and four from the third-floor balcony - adjoining the warehouse were rescued, said the Singapore Civil Defence Force (SCDF). Fifty firefighters were deployed to fight the flames, which engulfed the entire building. SCDF, in a post on its Facebook page at 6.04am, said it was alerted to the blaze at 65 Sungei Kadut Loop. A second post at 7.19am revealed that firefighters surrounded the three-storey warehouse with seven water jets and confined the fire to the building, which measures 100m by 50m. Four fire engines, two red rhinos, seven support vehicles and an ambulance were also deployed. It later shared photos of the onset of the fire, sharing that the flames had "engulfed the entire building". 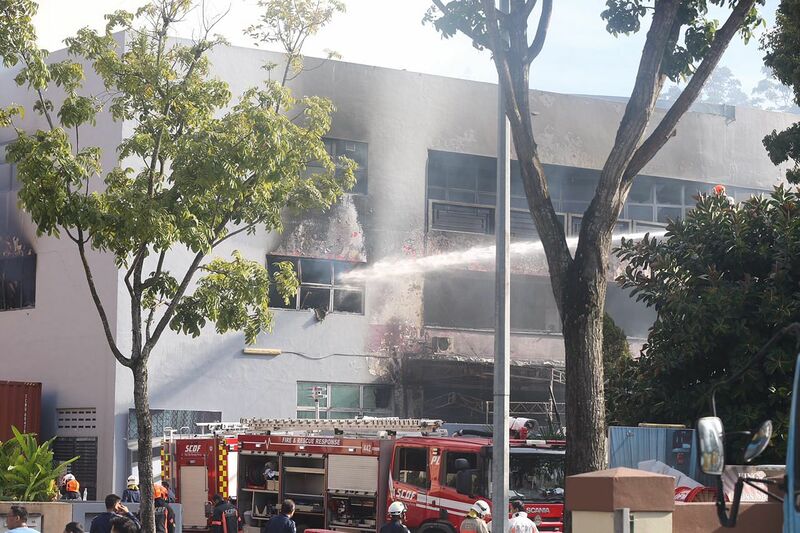 In its latest update at 8.49am, SCDF said firefighters were dousing small pockets of fire within the building. When The Straits Times visited the scene at around 8.30am, SCDF personnel were seen using water jets to contain the fire. The seven workers rescued are delivery drivers who were sleeping overnight at the warehouse as they had ended work late and were unable to get back to their dormitories. Mr Aung Aung, 40, a Myanmar national who was trapped on the third-floor balcony, said he was awoken by the sounds of five explosions. "I thought it was thunder, then I smelled smoke and the fire alarm rang. I was scared and I ran to the corridor to hide," Mr Aung told The Straits Times. "I was so scared I wanted to jump down from the balcony already." Another driver, 40-year-old Chinese national Mr Zhang, said the warehouse was filled with thick smoke and that firefighters had went up the staircase to guide them down. He added: "I took a hand towel, wet it with the rain and covered my mouth. I was choking." A video uploaded by Facebook user Lai Chee Sing showed massive flames rising from the top of the building. Another Facebook user, Saiad Salahuddin, claimed that an "explosion" was heard. Several users also posted photos of the fire on Twitter. User @horn8ge wrote: "oh wow huge fire at sungei kadut!!!" oh wow huge fire at sungei kadut!! !